India has nose-dived into a black hole, hurling itself downwards at supersonic speed. Even contemplating the abject fate of the victims of lynching in the last few seconds of their dissipating breath can make you feel nauseous, as they seek to be heard desperately amid the incessant thrashing by an unhinged crowd. But no one listens to their excruciating cries. The brutality and ugliness of the obnoxious bloodlust is unfathomable. This too is India’s new social reality — the lumpen gangs are on a warpath as lynching, a primitive spine-chilling form of public guillotining, is increasingly becoming the new norm. Between January 1, 2017 and July 5, 2018, as many as 33 persons have been killed and at least 99 injured in 69 reported cases of lynching. Now, even WhatsApp rumours are contributing to this mayhem. In normal circumstances, there would be universal condemnation of this revolting violence on unsuspecting victims, cutting across even diehard political competitors. But no, it does not quite work that way anymore. 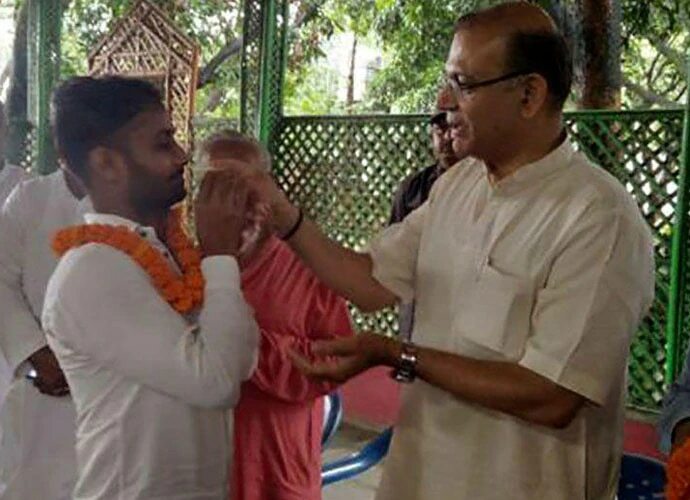 We live in extraordinary times, made even more extraordinary by the fact that BJP’s Jayant Sinha, a minister in PM Narendra Modi’s cabinet, actually garlanded several convicted (but out-on-bail) accused in his constituency of Hazaribagh. These men had lynched Alimuddin Ansari, a small trader, making him another statistical number in the escalating madness that is enveloping Mahatma Gandhi’s India. I thought social media reacted with shock and awe at young Sinha (his father Yashwant Sinha, an erstwhile senior minister in Atal Bihari Vajpayee’s government, chided his son publicly over a tweet) and his outrageous celebration of the accused killers. It appeared unpalatable to most that a suave former McKinsey pro with a Harvard Business School tag possessing impeccable articulation (which usually happens with abundant corporate networking and social schmoozing) and intellectual sophistry could indulge in such a morbid approbation of people with blood on their hands. It was an astonishing gesture of cool camaraderie with those who had killed a fellow brother while usurping law into their own hands. Ironically, the BJP, Sinha’s own party, is in power in Jharkhand. It effectively legitimised the horrible hate campaign that has transmogrified into a Frankenstein’s monster, taking giant strides. Soon, it might be outside your own window, ladies and gentlemen. Sinha has unwittingly trademarked lynching, giving it an official sanction; the consequences can be deleterious. Take a pause and think of what Ansari’s family would be feeling at the moment — their vulnerability, their fears and insecurity when the establishment itself is indulging in the glorification of menacing murderers. In a strange sort of way, I personally felt let down by Sinha. In the run-up to the Lok Sabha elections in early 2014, I briefly interfaced Sinha at a debate on the state of the Indian economy at the Trident Oberoi in Mumbai. At the time I was not aware whether he was going to contest the Lok Sabha elections, albeit it was being speculated widely in the media. Sinha possessed all the trappings that accompany loquacious investment bankers — much financial mumbo-jumbo interspersed liberally with high-sounding rhetoric, moral grandstanding and some statistical spins. Bottomline, he was impressive, and I came away with the feeling that perhaps the BJP had done a masterstroke in poaching this Boston banker. The only BJP spokespersons one had debated with on matters of economic policy earlier were Prakash Javdekar, Kirit Somaiya and Piyush Goyal, and with due respects, they were all hot air and nothing. Sinha would be a formidable proposition, I conceded. Some months ago, the only reason I agreed to do a TV show on India Today, where Sinha was a guest-anchor, was largely because I expected him to discuss substantive economic issues shorn of the archetypal political claptrap and trite sound-byte wars that his more voluble colleagues partake in. And thankfully, he did not disappoint me. In fact, I believed Sinha appealed to middle-class sensibilities by appearing reasonable and moderate in a Sangh Parivaar factory that frequently emanated inflammatory vitriol. His subsequent actions have been therefore stunningly blasphemous. Sinha is a manifestation of a deeply embedded political culture of the right-wing that is bare-faced about its communal objectives. For them, religious fundamentalism and blatant bigotry that especially targets susceptible minorities is not just a political tactic, but an intrinsic foundational philosophy; the two are thus inextricably intertwined. Lynching deaths that shook the nation commencing with Mohammad Akhlaq in Dadri in 2015 has a distinctive pattern. They happen sporadically to keep the communal temperature blistering, the state government dilly-dallies and looks the other way, and social divisions are aggravated with poisonous statements uttered liberally by official motor-mouths. Most of those feral characters who are accused are soon out on bail. And then Jayant Sinha comes along to garland them, besides allegedly doing fund-raising to meet their legal expenses. Sinha has just ensured, his belated apology notwithstanding, that the BJP has further solidified its communal infrastructure. Several leaders have defended him, and the prime minister, has of course, said nothing. India has nose-dived into a black hole, hurling itself downwards at supersonic speed. It could become an irreversible journey. Sinha’s reprehensible behaviour is a reminder to us all that human beings are fragile, especially those who treat their conscience as a tradable asset. Then there is nothing left.